Here is where we’re curating our list of the best Cyber Week deals on camping, hiking, and backpacking gear. We’ll update this page as we find deals worthy of your attention. Bookmark it and check back throughout Cyber Week to make sure you don’t miss any steep discounts. Note: If you’re interested in more Cyber Week deals on outdoor gear, check out our curated list of deals on climbing and bouldering gear. 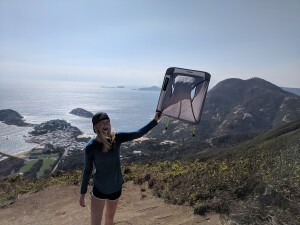 One of our gear testers demonstrates how light the Chair Zero is on a windy day on the Dragon’s Back Trail in Hong Kong. The Helinox Chair Zero is our top pick in our guide to the best backpacking chairs. At just 1.1 lbs it was the lightest and most portable chair we tested. The Zero has a weight capacity of 265 lbs and, despite being so light, is still plenty comfortable and durable. While we tested it as a backpacking chair it can double as a car camping chair, too. Currently the Zero is on sale for an impressive $50 off. This is the best price we’ve ever seen this chair go for. Top pieces of outdoor clothing from The North Face are currently on sale at REI for up to 25% off. One of our gear testers catches a sunset at Young Lakes in Yosemite National Park before crawling into her Hubba Hubba NX for the night. My dad’s original PocketRocket is still going strong after over 15 years of use. The original PocketRocket is an iconic lightweight backpacking stove. Growing up it was the stove my dad and I would use on our annual trips. The PocketRocket 2 is even smaller and lighter and tips the scale at just 2.6 oz. It boils water quickly and the collapses down to a compact shape that makes it easy to store in a cook pot. The Sawyer Squeeze is one of the most popular backpacking water filters, and it’s currently 32% off on Amazon. It has a fast flow rate and is slow to clog unlike some other filters. If it does clog it can be easily backflushed with the included plunger or the smartwater sports cap. The Smartwool PhD Outdoor Medium Crew Sock is our runner-up in our guide to the best hiking socks. It’s a versatile hiking sock that can double as a lifestyle sock on account of its variety of fun patterns. When we tested it we liked it for its comfort and moisture control. The merino wool wicked away sweat during activities like hiking, trail running, and even cross-country skiing. 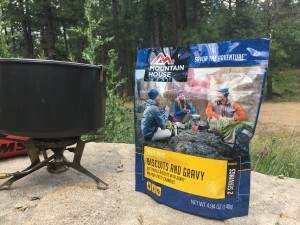 Mountain House is probably the most popular brand of freeze-dried meals for campers and backpackers. Their meals are tasty, filling, and easy to prep. And for a limited time a number of offerings are on sale for up to 33% off at Backcountry. Mountain House has a wide selection, so if you need help picking check out our guide to the best Mountain House meals — in it we taste test and rank 10 of their most popular meals. A sample of some of the Black Friday & Cyber Week deals on ultralight backpacking gear. A lot of the best ultralight backpacking gear is made by cottage industry companies, and many of these companies are having Cyber Week sales of their own. Luckily for us, the good people over at r/ultralight have curated a list of deals from these vendors. Many of them are taking place right now.